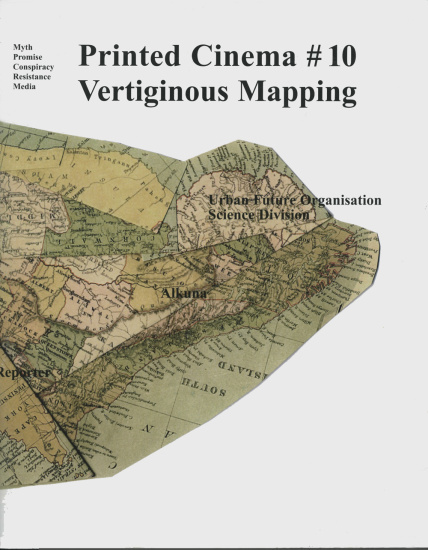 Printed Cinema is an ongoing attempt to reveal and unravel the cinematic organism, stressing the ephemeral nature of the image's surface by remaking it as printed matter. Rosa Barba has been publishing Printed Cinema alongside her film projects since 2004, as a kind of secondary literature, sourced from film stills, text and photographs. The publications are intended not as companion pieces to the installation event that they coincide with, but rather as a way to set experiments in word and image alongside cinematic still-image relationships, transferring them to an asynchronous realm. The book is acknowledged as the 'home' of narrative; Printed Cinema adopts its format, only to direct us down other possible paths, reshaping the fragments of text and images from the films into a momentary stillness. The result is intended as a 'free screening' wherever it is found, as it slips through (and is edited by) the viewer's own hands. Here, Barba adapts this format for the web, working from an edition that was published for her current show, on at Tate Modern through 8 January 2011. Taking images from the show, curator Ben Borthwick and writer Melissa Gronlund reflect on Barba's practice as well as on the difference in experiencing projected, printed and digitally published images. It may seem superfluous to assert that Rosa Barba's practice is, at its core, engaged with issues of temporality: her primary medium is film and all her other forms relate in some way to filmic practices, histories and genres. Her exploration of cinematic nuances and codes alludes to obscure points of reference in the history of cinema as well as to the history of film as a medium for exhibition. But it is not the literal fact of film being a time-based medium that is the focus of the works in this essay, but rather the ways in which temporality is spatialised and visualised by the different types of 'filmic' work on show. 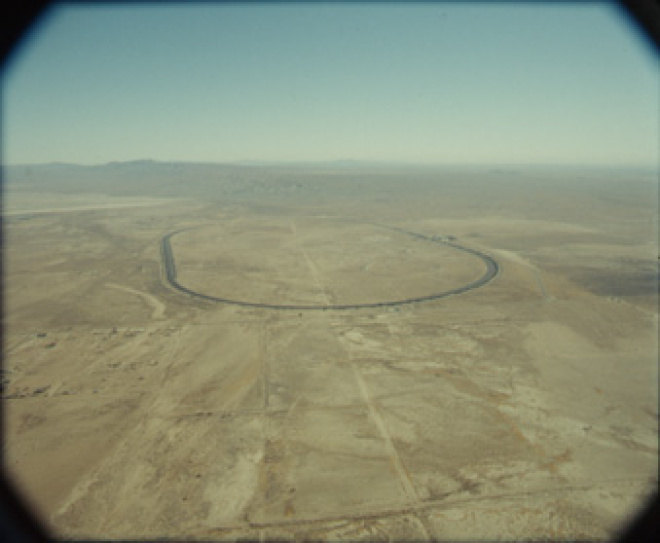 In Barba's film The Long Road, which bisects the gallery space at Tate Modern, she surveys a car racetrack in the California desert from a plane flying overhead: the long oval scratched into the arid landscape, a looped road going nowhere that cars, here absent, describe. 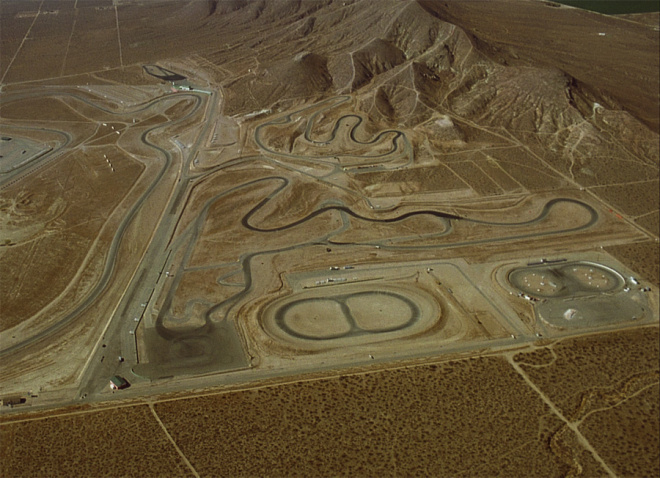 When the track is in use it becomes a grand act of landscape-size writing, a feat that sits in potentia in Barba's film. Indeed the work as a whole - the plane, the North American setting, the focus on the land - brings to mind Robert Smithson's Spiral Jetty (1970), the large-scale sculptural intervention in Great Salt Lake, Utah, that was Smithson's own attempt to inscribe art into the landscape. The 16mm projector is no longer a given when it comes to displaying films shot on 16mm, which are more commonly converted into digital files and played on digital equipment. 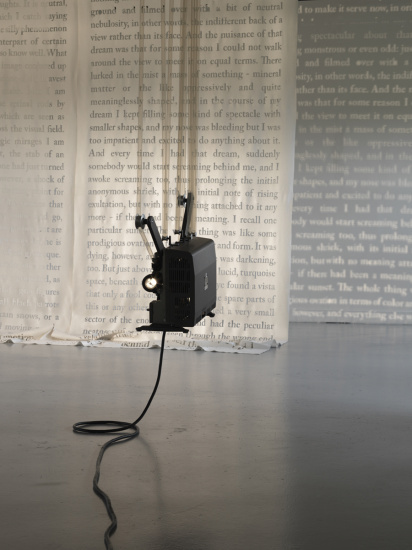 Barba's placement of the projectors in gallery spaces articulates, instead, an engagement with historical display practices that is certainly fetishistic - and Barba engages with this desire directly. Her projectors are not simply there as the functional means by which the image is projected, but instead invert the relationship between subject and object by which the projector becomes the end in itself. 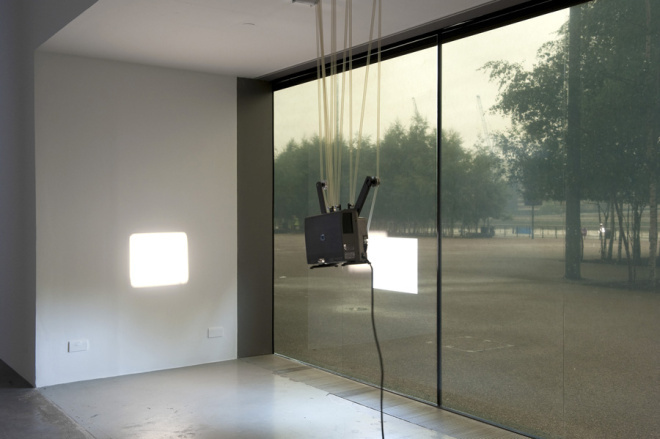 A work like Stating the Real Sublime (2009) is an astonishing object, completely fetishistic and irrational in many different ways - most strikingly in that it is a heavy piece of equipment suspended from the ceiling by the diaphanous loop of film that spins through its system. Sometimes it is installed to illuminate a square on the wall, at others it casts an anamorphic streak of light across the floor. The film it projects has no image other than the dust scratches that breed on the surface of the celluloid, slowly accumulating over the course of the exhibition. The power cable slumps untidily to the floor beneath the projector in a disorderly coil, as if to contradict the taut rationality of the loops above it, implying the projector is invested with alchemical powers to transform entropy into order - unless, of course, it is the other way around. While the materials are exclusively filmic, an encounter with a room of these works is a multisensory spatial experience. Beyond the machines occupying space in a highly choreographed manner with projections hitting various surfaces, the buzz of the projectors mixes with soundtracks of clips of electronics, industrial drones, spoken word, melody and field recordings. There is the smell and taste of static from heated lamps and overworked machinery, the temperature slightly raised and atmosphere literally charged with electricity. Barba's series of felt drape sculptures address the issue of instability even more emphatically, as in them the object's status as narrator or narrative is blurred further still. These works create a circuit of elements in which each alternates as the locus of meaning. Like others in the series, has a stencilled text that has been cut out. Its shape makes clear reference to the familiar proportions of a screen while the thick felt evokes the materials of post minimal sculpture. It is suspended in front of the wall - far enough to peer behind, but close enough to prevent anything but the most oblique view. A bright spotlight illuminates the black surface, casting a dark shadow onto the wall behind, within which the cut-out text is illuminated. The drape's materiality is highlighted by the spotlight which, simultaneously, negates its legibility: a moire effect is created by the interplay of light and dark, positive and negative space, foreground and background. The text is only legible where the two layers - material and immaterial - do not overlap: a couple of lines can be read through the felt surface at the top edge, and a couple of lines of shadow at the bottom, and the words at the edges of the shadow. 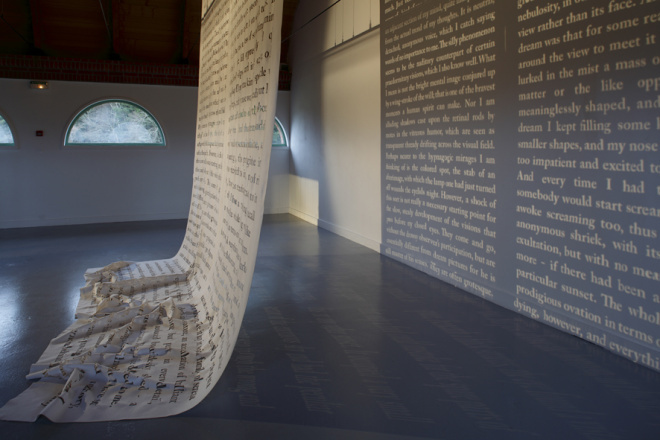 By placing the text in clear view, but encrypting it through a series of aesthetic strategies, the artist undermines any notion of the act of reading as an unmediated experience of knowledge: certain positions will offer fragments, but the whole is elusive and can only ever be made legible through a painstaking process of deconstruction and reassembly. The uncertainty of the status of the text is mirrored in the object's form by making the drape function simultaneously as negative, projector, and screen: it is a contradictory object that defines itself by the presence and absence of light on its surfaces. 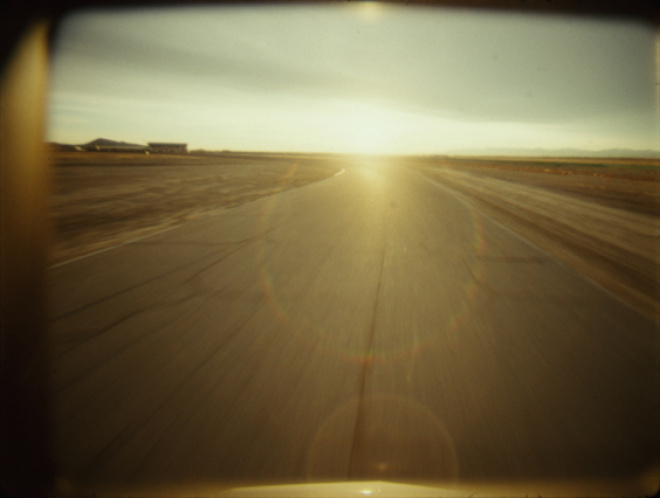 Barba's recent films tend to focus on large-scale landscape phenomena. 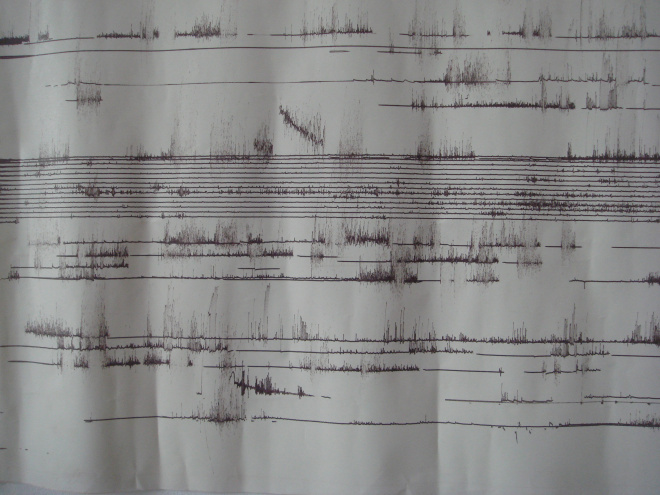 The Long Road (2010), The Empirical Effect (2009) and Outwardly from Earth's Centre (2007) are all framed by long aerial tracking shots. These are juddering and handheld, more connected to the representation of memory, documentation and investigation than the gliding spaces of fantasy in narrative cinema. This is the image of empirical observation familiar from military reconnaissance, or Robert Smithson's Spiral Jetty, in which a particular feature of the landscape is circumnavigated at a sufficient distance for it to embody myth. Like Spiral Jetty, Barba's The Long Road is set in one of the deserts in the American West, continuing her ongoing fascination with this landscape that articulates the geographical and psychological limits of North American consciousness. There is no sign of human habitation, although the landscape has a history of military experiments from which a bounty of myths and conspiracy theories spring. From the aerial point of view it is not immediately obvious what the track is: the shape is a paper-clip oval, perfectly symmetrical, with a doodle inside it. For while Spiral Jetty is built up into the existing landscape, this structure seems to have been gouged out of it. If Smithson's choice of the spiral links his monumental work to ancient hieroglyphs, The Long Road points towards the futuristic industrial myths of science fiction, its otherworldliness reinforced by the aerial shot's familiarity as a visual code for military suspicion. Nonetheless, viewed from on high it has the quality of a drawing or sculpture, held in place by a geometric lattice of straight lines that criss-cross the surface of the ground. After a 180-degree sweep there is a sudden cut and the shaky handheld aerial perspective is replaced with a view that glides along a road, sweeping left and right along the same surface that has just been shown from above.